The total imports and exports on the eve of the French invasion (in 1830) did not exceed £175,000. By 1850, the figures had reached £5,000,000; in 1868, £12,000,000; in 1880, £17,000,000; and in 1890, £20,000,000. From this point progress was slower and the figures varied considerably year by year. In 1905 the total value of the foreign trade was £24,500,000. About five-sixths of the trade is with or via France, into which country several Algerian goods have been admitted duty-free since 1851, and all since 1867. French goods, except sugar, have been admitted into Algeria without payment of duty since 1835. After the 1892 increase of the French minimum tariff which applied to Algeria for the first time, foreign trade greatly diminished. GDP per capita grew 40 percent in the Sixties reaching a peak growth of 538% in the Seventies. But this proved unsustainable and growth collapsed to a paltry 9.7% in the turbulent Eighties. Failure of timely reforms by successive governments caused the current GDP per capita to shrink by 28% in the Nineties. This is a chart of trend of gross domestic product of Algeria at market prices estimated by the International Monetary Fund with figures in millions of Algerian Dinars. In 2007 Algerian imports totaled US$26.08 billion. The principal imports were capital goods, foodstuffs, and consumer goods. The top import partners were France (22 percent), Italy (8.6 percent), China (8.5 percent), Germany (5.9 percent), Spain (5.9 percent), the United States (4.8 percent), and Turkey (4.5 percent). In 1958, Charles de Gaulle’s return to power in response to a military coup in Algiers on May was supposed to keep Algeria’s status quo as departments of France as hinted by his famous, yet ambiguous, speeches delivered in Oran and Mostaganem on June 6, 1958. De Gaulle’s republican constitution project was approved through the September 1958 referendum and the Fifth Republic was established the following month with De Gaulle as its President. On February 23, 2005 the French law on colonialism was an act passed by the Union for a Popular Movement (UMP) conservative majority, which imposed on high-school (lycée) teachers to teach the “positive values” of colonialism to their students, in particular in North Africa (article 4). The law created a public uproar and opposition from the whole of the left-wing, and was finally repealed by president Jacques Chirac (UMP) at the beginning of 2006, after accusations of historical revisionism from various teachers and historians. Algerians feared that the French law on colonialism would hinder the task the French confronting the dark side of their colonial rule in Algeria because article four of the law decreed among other things that “School programmes are to recognise in particular the positive role of the French presence overseas, especially in North Africa, …” Benjamin Stora, a leading specialist on French Algerian history of colonialism, said “France has never taken on its colonial history. It is a big difference with the Anglo-Saxon countries, where post-colonial studies are now in all the universities. We are phenomenally behind the times.” In his opinion, although the historical facts were known to academics, they were not well known by the French public and this led to a lack of honesty in France over French colonial treatment of the Algerian people. 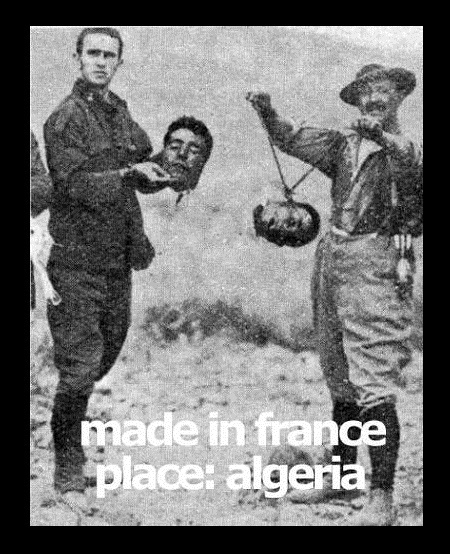 Algérie française was a slogan used about 1960 by those French people who wanted to keep Algeria ruled by France. Literally “French Algeria,” it means that the three départements of Algeria were to be considered integral parts of France. In Paris, during the perennial traffic jams, adherence to the slogan was indicated by sounding one’s automobile horn in the form of four telegraphic dots followed by a dash, as “al-gér-ie-fran-çaise.” Whole choruses of such horn soundings were heard. This was intended to be reminiscent of the Second World War slogan, “V for Victory,” which had been three dots followed by a dash. The intention was that the opponents of Algérie française were to be considered as traitorous as the collaborators with Germany during the Occupation of France.